Experts expect Bitcoin to go as high as $6,000 by the end of the year, and over $10,000 by the first half of 2018. Bitcoin prices surged past the $5,300 mark on Thursday, closing at $5,363 — only to reach a new all-time high value at $5,856.10 some time early Friday morning, after markets had opened at a $5,439. The increase in value comes after Russia banned Bitcoin and expressed interest in rival Ethereum. The Russian ban followed previous moves against cryptocurrencies by South Korea and China, which included prohibiting initial coin offerings (ICOs). The market, it would seem, finally got over the fears incited by these moves. At the time of writing, revitalized Bitcoin is now at $5,714.95 marking a more than 13 percent increase in value in less than one day, and an over 30 percent increase in just one week. It isn’t the only cryptocurrency benefitting from the price surge, as the overall cryptocurrency market cap peaked at $171.94 billion early Friday morning — almost reaching a high comparable to that of September 1, when it reached $172.5 billion. 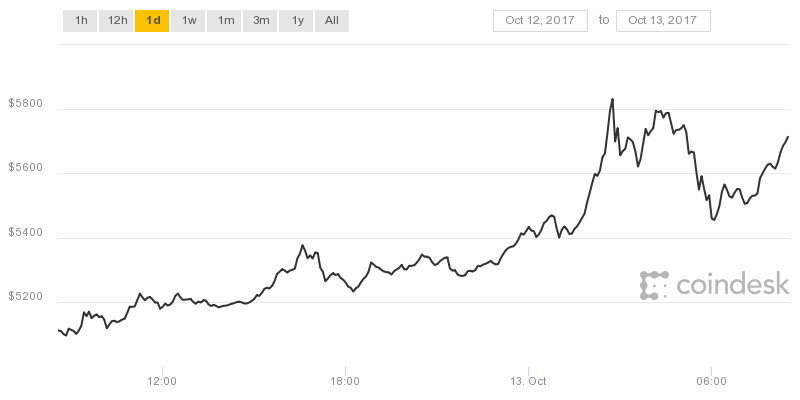 Bitcoin, which makes up more than 55 percent of the whole crypto market, capped at $95.5 billion today (Friday, Oct 13). Cryptocurrencies are no stranger to fluctuations in prices, which critics are always quick to note. Experts say crypto is destined to be more than a fad however, and that Bitcoin’s popularity will herald a bigger blockchain revolution. Whatever the case may be, experts expect Bitcoin to go as high as $6,000 by the end of the year, and over $10,000 by the first half of 2018.